Whether you’ve had an amazing year or simply can’t wait to see 2012 pass you buy, one thing is for certain: New Year’s Eve is almost upon us, and that means an evening full of adult beverages, Auld Lang Syne playing at midnight, and a morning full of regret after that 10 you went home with turns out to be a two. While we deeply regret not being able help you with the last part, we’d like to see you safely into 2013 all the same. That’s why we’ve come up with this handy list of apps for iOS and Android to ensure you ring in the New Year safely by not drinking and driving. Let’s face it, you’re probably going to drink tonight — a lot. But that doesn’t mean you can’t go about it responsibly. Rather than try to remember what you’ve been knocking back all night, Alcodroid helps keep tabs on exactly what you’ve had. A drinks diary helps you chart your drinks by day, week, or month, and a blood alcohol content reader (BAC) lets you know when you’re over the legal limit based on how much you’ve had to drink. By letting you set up “drink presets” for custom drinks, as well as pin your most frequently consumed drinks to the home screen for quick logging, Alcodroid makes tracking your drinks fast and easy. Think you might be enjoying grandpa’s old cough medicine a bit too much? Alcodroid allows you to setup drinking goals, and not the “how many shots you can down in one night” variety. 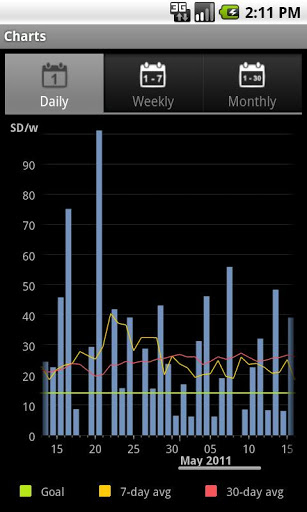 Instead, users can set weekly limits, say 15-20 in a week, to help chart and change drinking habits. 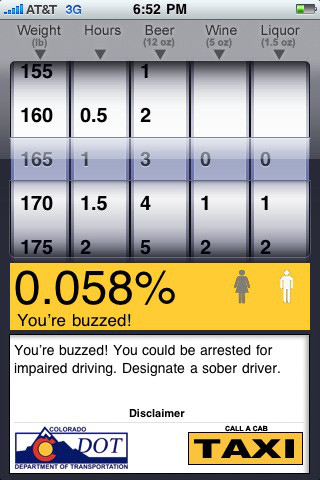 The app then calculates and displays your BAC number and informs you whether or not you’re too intoxicated to drive. A GPS feature marks your current location and helps you locate a cab. While R-U-Buzzed might be made by the fine folks at CDOT, be sure to heed the apps disclaimer: “This blood alcohol concentration (BAC) calculator is only an estimate and is not sufficiently accurate to be considered legal evidence.” Think you had too much? You probably have. So you said you weren’t going to drink tonight, but then gave into sweet temptation. You drove to the bar, but you realize you’re too hammered to drive home. You could call a buddy, but you’re fresh out of favors. You could call a cab, but what about your car? Well, there’s an app for that. StearClear is a personal chauffeur service where you supply the wheels. The app uses your phone’s GPS to locate you’re exact position, and a team of two professional drivers are dispatched to your location, ensuring you get home safe and sound. 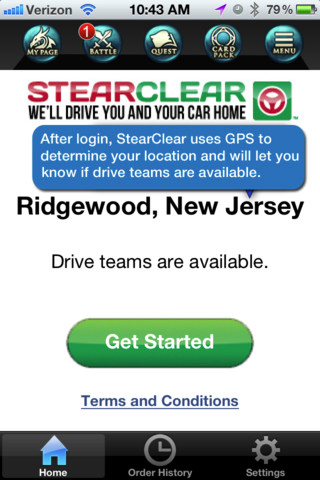 Payment and tipping is handled entirely through the app, but at present a couple drawbacks exist: StearClear is currently only available in New Jersey, Manhattan, and Pennsylvania, and it isn’t cheap, with a $20 pickup fee and an additional fee of $2 per mile. Similar to Alcodroid, Drink Tracker helps monitor your BAC, record how many drinks you’ve had, and features a handy one-tap drinks list, which you can customize for fast tracking. Multiple drinkers can track their drinks, with up to three profiles allowed on one device. Users simply input their gender, age, height, and weight, and Drink Tracker will update that user’s BAC level automatically every 60 seconds, even if the app is turned off. A target BAC can be entered, with a countdown timer showing how long until that target is reached. Drink Tracker even adds some social elements with the optional ability to auto tweet when you’ve had a drink. A simple one-button GPS feature called “Outta Here!” will use your current location to give you directions home, find a taxi, or send an SMS or email to friend notifying them of where you need to be picked up. GI Joe said “knowing is half the battle,” and we’re inclined to agree. How many times has a friend stumbled their way out the bar door, keys in hand, determined to drive, and clearly intoxicated, stubbornly trying to convince everyone of their sobriety, while you argue to the contrary. If only they knew how drunk they were, half the battle would be won. Well there is, and it’s called BreathalEyes ($0.99). Using the iPhone’s camera to detect involuntary eye-movements, known in the medical world as Horizontal Gaze Nystagmus (HGN), BreathalEyes informs potential drunk drivers when they’ve had one drink too many. 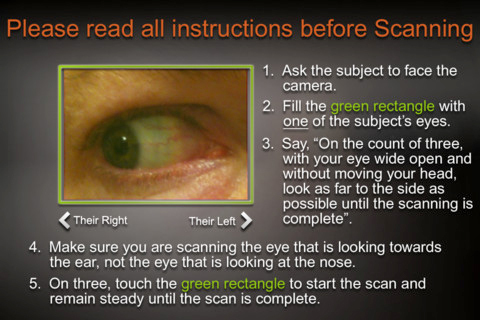 BreathalEyes requires a second person (preferably sober) to scan the recipient’s eyes and administer the test, so it won’t work if you’re running solo. Like R-U-Buzzed? BreathalEyes won’t stand up as legal evidence, but rather is intended for entertainment purposes. 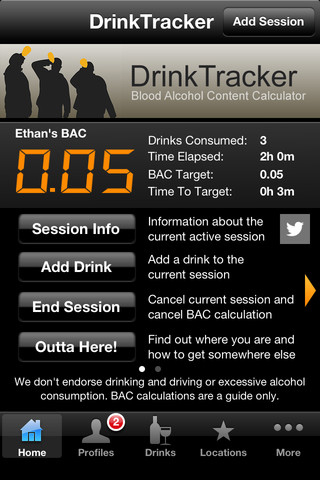 The app only works within an effective range of 0.02 — 0.18 percent, with (+/-) .02 percent accuracy of BAC levels. Put simply, it’s meant to show your drunk friends that they need to hand over the keys because they’re too intoxicated to drive.